Seven Habits of Highly Effective People !! Seven Habits of Highly Effective People by Stephen R. Covey is an excellent book that probably almost everyone has heard of. Millions of people have read it, but unfortunately many people don't make the commitment to actually apply the habits in their everyday life. If they did, it's a "can't miss" success formula. However, it is not an "instant fix" formula that is the rub for many. Anybody can drastically improve their effectiveness if they simply take the time to master what Covey is trying to convey to them. The beauty of these habits is just that, they are habits. You don't have to change your personality, to become effective. You have to adopt new habits. Once a habit becomes part of your daily routine, the effectiveness just kicks in automatically. Covey argues, our viewpoint needs to be driven by a principals-based approach, to live our life according to principals we value and hold dear. These principals are permanent and unchanging - like a rock in a storm.He states that we can build our self-confidence by making personal commitments to ourselves - and keeping them. Each time we do, our self-confidence increases. We live our life according to certain "scripts" that we've acquired and developed along the way. In fact, as intelligent beings, we have a "space" between the stimulus and the reaction which allows us to create our own scripts. Our relationship with ourselves and others is based on deposits and withdrawals to emotional bank accounts. Every time we honor a commitment, we make a deposit. Every time we break one, we make a withdrawal. The key point here is to never make a commitment unless you're sure you can honor it, and if you can't honor it, do your best to explain why. Don't take your commitments casually. Take, for example, the problem of stress. Well, one major cause of stress and burnout is that people are constantly living in "crisis mode" - i.e. going from one crisis to another. Covey shows how to deal with that. He has a very simple habit (which will take some effort to implement in spite of that, just because most of us habitually do not do this) by which you can prevent crisis from occurring in the first place, or at least prevent crisis from being as bad when they do occur. Another thing that was very helpful to me was his chapter on pro-activity. Basically, we might not always get to choose our circumstances (all of us have been in circumstances we did not want to be in before), but we can all choose how we respond to these circumstances. An interesting exercise he performs regularly with college students: visualize that you only have this semester/quarter to live. During that time, you are to stay in school as a good student. What would you do differently? It has apparently had some amazing results. It's interesting to think about; too often we lose sight of what's really important I think. You create your own behavior. You have the ability to choose your responses to life. You are as you are today because of the choices you made yesterday. Replace "I have to.." with "I choose to...". First create your principles. This is leadership (vs. management). Realize all things are created twice. The first time is in your mind. Write your mission statement that lists the values you want to live by. Prioritize every day. What is one thing that you could do on a regular basis that would make a tremendous improvement in your life? Do it. List out the roles you play in life. List out the most important goals in each. Map out time for each in the upcoming week. Both parties should benefit from an agreement. This builds relationships. Agreements should cover the desired results, guidelines, accountability, standards and consequences. Listen to understand, not to reply. Listen with empathy and appreciation. Find out how they are 'centered'. The whole is greater than its parts. Creativity blossoms here. Spend at least a half hour everyday on your physical, spiritual, mental and social/emotional dimensions. Life is a process. The 7 Habits are timeless. 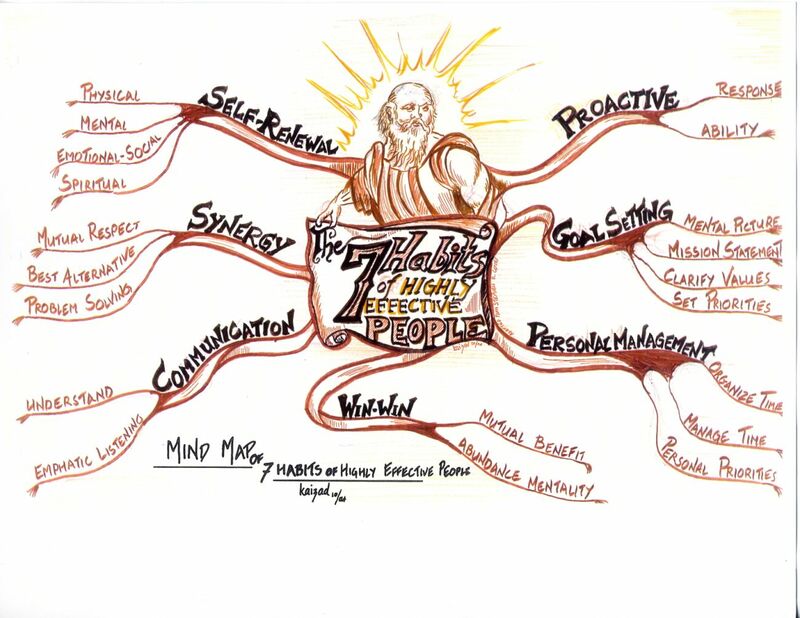 Covey spent his life trying to put The 7 Habits of Highly Effective People together, and it shows. I have read this book and I also own the audio version, which is recorded in the author's voice. Whichever you decide to do, you want to own this book, and take OWNERSHIP of its contents. Now remember, you are not going to get out of a CD what you are going to get out of a book. They are radically different media experiences. With a book, you can annotate the margins, underline, write on the inside blank pages. With the CD's in the car, you are taking what is essentially wasted time, and turning it into wonderful, well-spent time. Covey's concept of "Sharpening the Saw", which is a summary of the habits, and how you can RENEW yourself is worth the whole price of the book or audio set alone. Treat the book as a process of continuous learning about personal vision, leadership, management and human relations both at work and in family. Use it as my guide for dealing with people and in integrating the different responsibilities in life: professional, family and personal. This is an exceptional book for those that wish to live a happy, healthy, meaningful and successful life and to increase productivity in both business and personal basis. 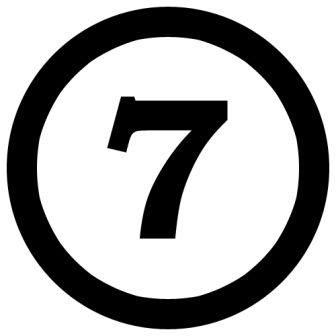 FREE Subscription - Click here to get articles like ' Seven Habits of Highly Effective People !! ' in your Email. Excellent post. The book has been one of my favorite for a while. I like the point you make about these being habits and do not really affect one's personality. But don't you think that habits are part of whom we are, part of personalities? Thanks Khalid! I think over time your habits will dictate your personality but small shifts in habits are not going to affect your overall personality. It also differs from individual to individual. If you make it a habit of getting up early every morning then over time you will be more disciplined but your personality might still be blunt or cheerful whatever you were like before. See personality is a component of the ego and the habits are developed by exercising the will over the ego. It is a power of the spirit. What do you think?